What does 'Vero Cuoio' mean? When searching for the perfect pair of men's shoes, it's crucial you know how to spot quality craftsmanship. 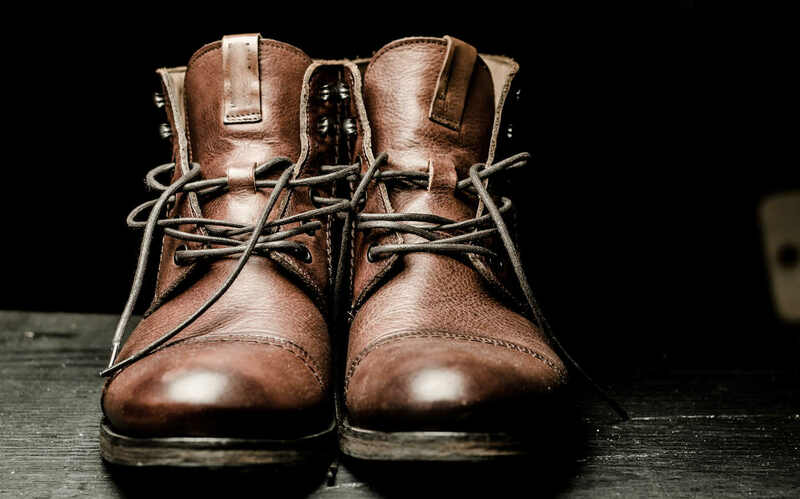 After all, poorly constructed men's shoes will be at risk of falling apart or wearing down in a short space of time, so selecting the right pair will save you a lot of hassle. Finding footwear with the mysterious words 'Vero Cuoio' is a good sign the materials used in the construction are suitable for a high quality dress shoe. The words 'Vero Cuoio' is an Italian phrase which literally means 'True Leather'. The word 'Vero' derives from the Latin 'Verum', meaning 'real' and 'Cuoio' from the Latin 'Corium' meaning leather. This phrase has become synonymous with a superior leather product for many years. When searching for the perfect pair of leather or suede men's shoes, you should look out for this phrase. It also has an internationally recognised leather symbol in the form of a pictogram. Seeing this phrase and symbol will serve to reassure you of its quality leather construction. The above left symbol is synonymous with genuine animal leather. The Italian tannery industry association - UNIONE NAZIONALE INDUSTIRA CONCIARIA trademarked the symbol in 2004. They decided it was an appropriate step in protecting the members from imitators using inferior products such as reconstituted leather. So, if you buy a pair of men's shoes that does not have this recognised symbol of excellence, there is a chance you've purchased an inferior product. Raw leather used to manufacture leather soles, heels and insoles were originally made using natural products, such as Oak Bark or similar barks containing tannin. These leathers took several years to produce. During this time, the hides absorbed the tannins, creating a more stable structure. The liquors created by this process varied in strength. Initially, a weaker mixture allowed the tannin to slowly penetrate deep into the leather and not just tan the surface. Every tannery has their own recipe handed down over generations, but the underlying principle is the same. Modern vegetable tanned leather is a speedier process. However, as a rule of thumb, the longer the process takes, the better the quality leather. Therefore, if you're looking for the best quality leather when buying a pair of men's designer shoes, it's important to remember that time and traditional skills learnt over hundreds of years plays an important role in the result. As mentioned previously, quality leather craftsmanship is a long process. As sole leather is a natural product, many top-grade Italian factories keep an entire year’s supply of hides in underground vaults! This allows them to fully dry out, cure and mature. 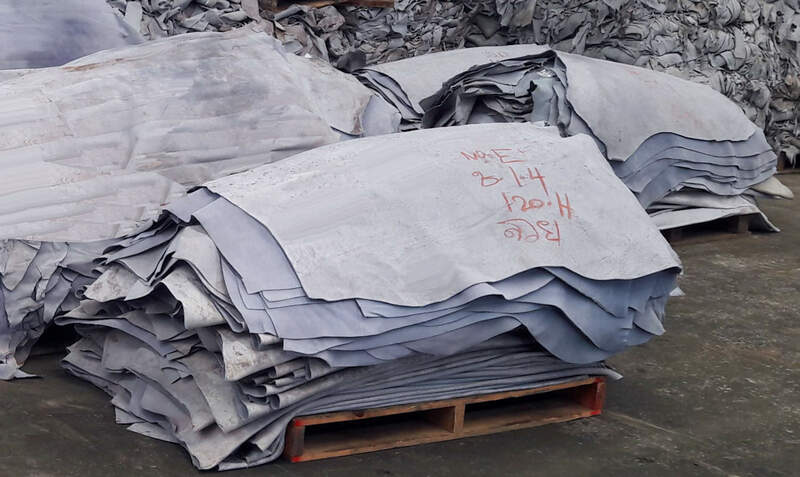 If you are ever fortunate enough to visit a high grade shoe factory, you'll notice a vast number of pallets in the vaults stacked with hides - all in a carefully controlled environment. The temperature, humidity and light is precisely monitored and controlled to ensure they are perfect for the clicking & cutting process. So, the next time you buy a pair of men's designer shoes, not only will you know that the leather has taken time to tan, but will have been stored for many months in one of these vaults until it is in peak condition. One of the best hides for leather soles comes from Argentina. This is thanks to their wet blue hides. The term 'wet blue' originates from the light blue colour tinge this material naturally possesses and is a pre-washed, scraped of its hair and salted skin to preserve the leather for transport. It has a very good reputation being one of the best hides for this type of sole leather thanks to its flexibility, durability and ability to breathe. That said, modern polymers have helped the introduction of lighter weight soles and have replaced a lot of traditional leather soled footwear. Many expert shoemakers prefer the compromise of having a full leather sole, but with a rubber polymer insert for slip resistance. “Vero Cuoio” soles are not entirely waterproof but have a degree of breathability, especially when used as an insole. You might have also heard of 'Bonded Leather'. Tanneries use grinding machines to break up waste leather into a fine mulch. The mulch is combined with a polymer (think of it as glue) to create a leather cloth which can be used as a lower quality 'genuine leather' substitute. Technically this is still leather, but it has very different wear properties. Bonded leather mass-produced insoles are common in cheaper footwear, but are generally less durable than genuine “Vero Cuoio” insoles. You should rotate the shoes you're wearing (or any leather shoe for that matter) on a daily basis. This allows them enough time to dry out and avoid the build up of odour-inducing bacteria. “Vero Cuoio” leather insoles are the preferred choice for this reason. 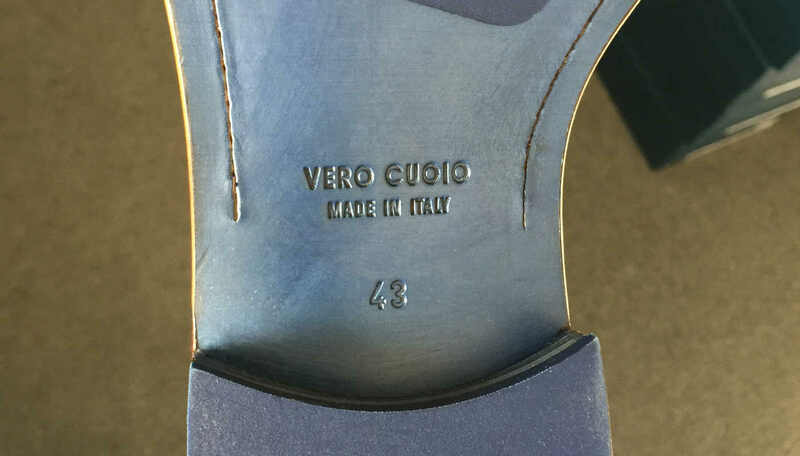 Clearly, the 'Vero Cuoio' trademark is still relevant to modern high grade shoes and continues to represent quality and authenticity.